-- Most "arts and crafts" Hanukkah lamps ("Hanukkya"), made by children are not suitable for lighting and may burn down when used. -- Place the Hanukkah lamp on a sturdy surface made of nonflammable material such as marble, glass or metal. 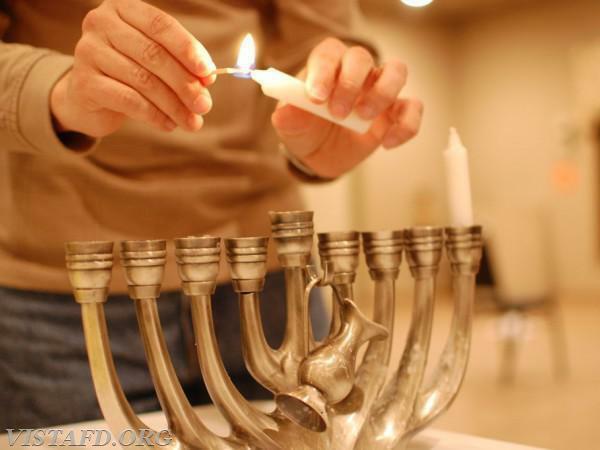 -- Place the Hanukkah candles ONLY inside the Hanukkah lamp or candlesticks made of nonflammable material. -- Do not place the Hanukkah lamp near or under any flammable material such as curtains or books. -- Do not walk around while holding a lit candle. -- Do not place the Hanukkah lamp in a location where it can be knocked over - either by a passing person or the wind, or where something can fall on it. -- Keep matches and lit objects away from children. -- Make sure your pet cannot reach the Hanukkah lamp. -- Never leave a lit Hanukkah lamp unattended!